Top U.S. colleges and universities value the diversity that students from outside the U.S. bring to campuses. And increasingly more international students are applying to U.S. colleges—a trend that is expected to continue in the long-term. Experts predict that the number of international applicants to American colleges will triple in the next decade, after surging more than five-fold in the last decade. Unfortunately, with class sizes remaining stable, an increase in applications also means a decrease in the percentage of applicants who will be accepted. If you want to know your chances of being admitted to top U.S. colleges, Go4Ivy can accurately calculate your probabilities of getting in. Go4Ivy has been helping students figure out where they can get in for more than a decade and boasts greater than 90% accuracy for chances of admission predictions. Find out your chances of admission now or read on to learn some helpful tips about applying to U.S. colleges and universities as an international applicant. Applicants whose first language is not English are typically required to take the TOEFL, a standardized test, which the test-maker says “measures the ability of nonnative English speakers to use and understand the English language as it is heard, spoken, read and written in the university classroom.” Top U.S. colleges place high importance on this test, so your score directly affects your chances of getting in to top colleges. Go4Ivy considers TOEFL scores as part of the hundreds of variables taken into account when calculating chances of admission for international applicants applying to U.S. colleges. Although U.S. colleges and universities have increased their efforts to recruit international students, most U.S. colleges do not offer much in terms of financial aid for international students and it is much more difficult for international applicants who need financial aid to get accepted. If you are able to pay your way and don’t have to check the box saying you plan to apply for financial aid, you are at a distinct advantage. While some well-funded and highly competitive top colleges claim to extend their “need-blind” admissions policy to international students (meaning that the applicant’s financial situation is not considered in the admissions decision), the vast majority of colleges limit need-blind admissions to U.S. applicants only. Although students applying to top U.S. colleges from India and China bring diversity to the student body, those countries are also the ones from which colleges receive the most international applications. In the interest of diversity, colleges are motivated to admit students from a variety of different countries and, therefore, cultures. So, it is pretty clear that students applying from countries with more applicants face increased competition, which makes it even more important for applicants to communicate what makes them unique compared to other applicants from the same country. Similarly, students applying from countries with fewer applicants and less representation among the student body face less competition when applying to U.S. colleges. However, competition is still high whether you are applying from a highly-represented country like India or a less-represented country like Brazil. Applying to top U.S. colleges can be an expensive and time-consuming process. Go4Ivy can help you narrow down your list of colleges by providing you with a chances of admission report. 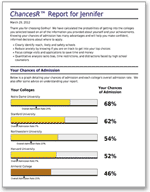 Our experts have developed a highly accurate technology that assesses hundreds of variables (including test scores, GPA, activities, and more) and calculates your probability of getting into top colleges, so you can find out which top U.S. colleges offer you the best chance of admission and ensure that you’re applying to a range of reach, likely, and safety schools. Whether you’re interested in top engineering colleges, the Ivy League colleges or other top colleges, you can find out your chances of admission today. A great planning tool! See if you are on track to get into your top choice colleges. Your percentage chances of admission will be calculated based on your academic and extracurricular achievements and current test scores (PSAT, SAT, ACT, SAT Subject Tests). Or, run a "what-if" scenario based on your projected test scores and achievements. One free revision of test scores and/or GPA is included in the price of the report.